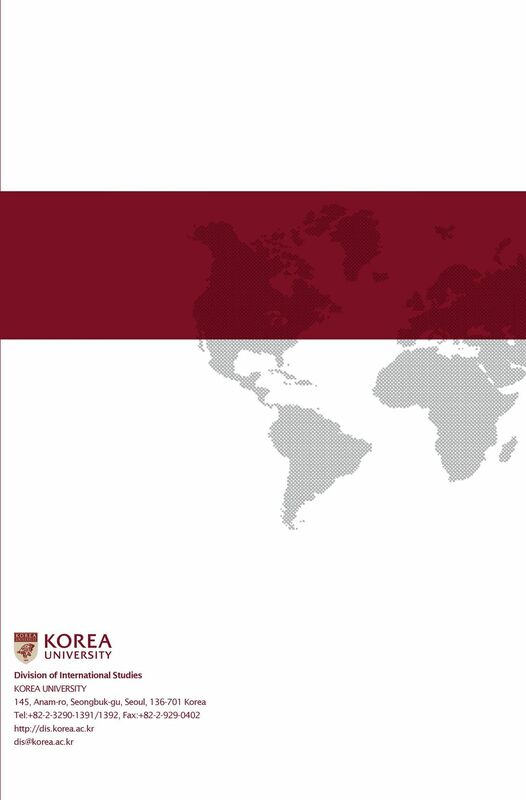 Download "KOREA UNIVERSITY Division of International Studies"
5 Core Courses All Students are required to take the following courses: Principles of International Commerce Principles of International Relations Globalization and Beyond: Culture, Society, and Political Economy Degree Programs DIS offers a wide range of program choices in five main areas of international studies: International Commerce, International Peace and Security, International Development and Cooperation, Area Studies, and Korean Studies. Professional experiences and specializations are integral aspects of these programs. Peace, International Political Economy, Politics of Global Governance, Human Rights in a Global World, and Energy and International Relations. International Development & Cooperation This program examines the relevant issues in international development. Students will explore diverse aspects of interactions among states, international organizations, and individuals in reducing poverty, tackling ecological challenges, and providing sustainable development. The courses on offer include: International Law, Economic Development in a Globalized World, International Economic Law, International Economic Cooperation, Environment and International Relations, Resources and Global Development, and Issues in Sustainable Development. International Commerce The goal of this program is to provide students with a better understanding of international commerce in the course of globalization. Relevant courses will equip students with the skills, knowledge and experience necessary in the fields of trade, finance, business and marketing. A wide range of relevant courses includes: Understanding Economics, Multinational Corporations, International Finance: Theory and Practice, International Economic Cooperation, International Economic Institutions and Policy, East Asian Economies, Trade Policies of Korea, Digital Economy and E-Commerce, and Intellectual Property for Business. Area Studies The Area Studies program offers students with a list of courses that are developing broad and good understandings of current global issues related to various countries. Some exemplary courses are: Contemporary North America, Contemporary East Asia, Contemporary Europe, Understanding East Asian Civilization, East Asian Economies, The U.S. Economy, European Economies, International Relations of North America, International Relations of East Asia, International Relations of Europe/Russia, and Korea-U.S. Relations. 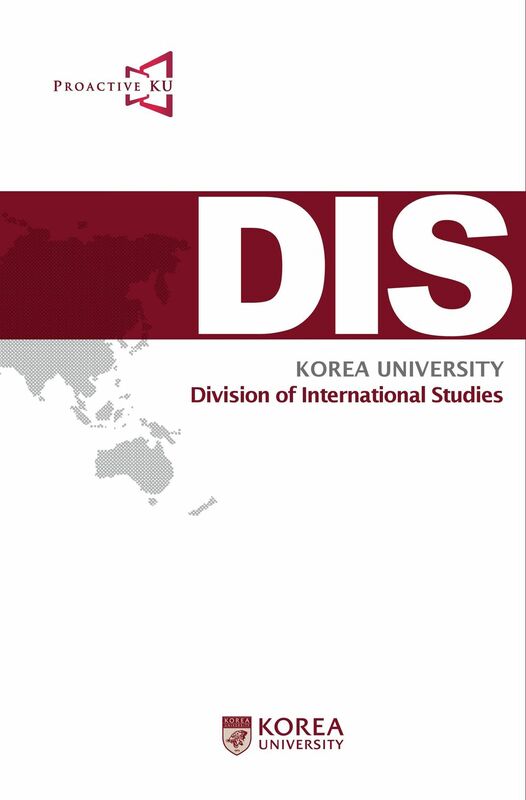 Korean Studies International Peace & Security This program provides rigorous and policy-relevant courses in global politics with a special focus on international peace and security. 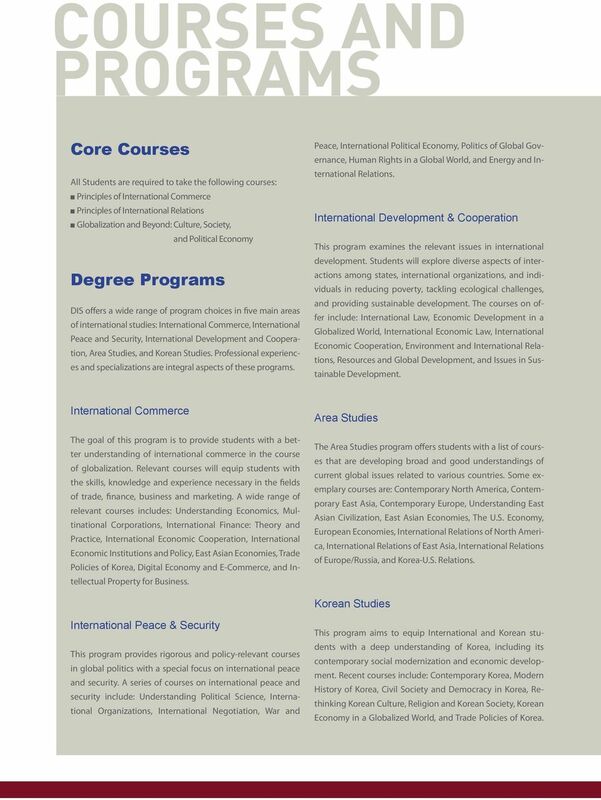 A series of courses on international peace and security include: Understanding Political Science, International Organizations, International Negotiation, War and This program aims to equip International and Korean students with a deep understanding of Korea, including its contemporary social modernization and economic development. 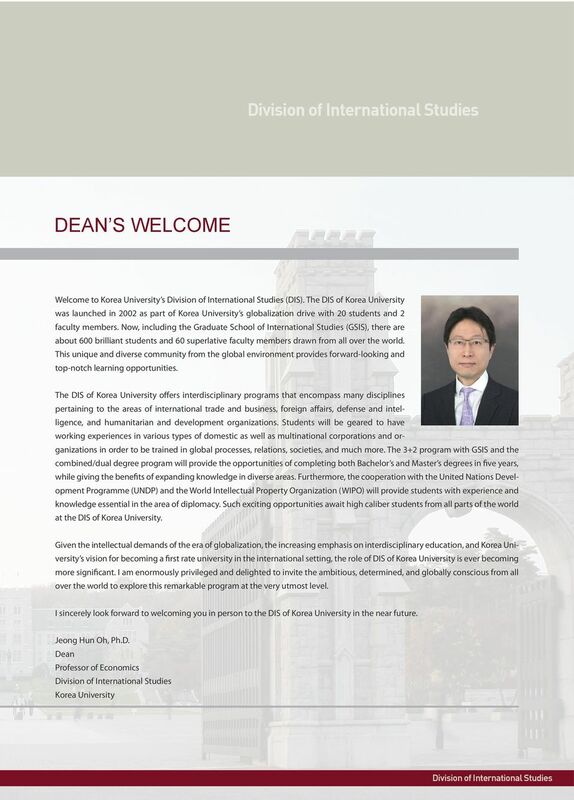 Recent courses include: Contemporary Korea, Modern History of Korea, Civil Society and Democracy in Korea, Rethinking Korean Culture, Religion and Korean Society, Korean Economy in a Globalized World, and Trade Policies of Korea. 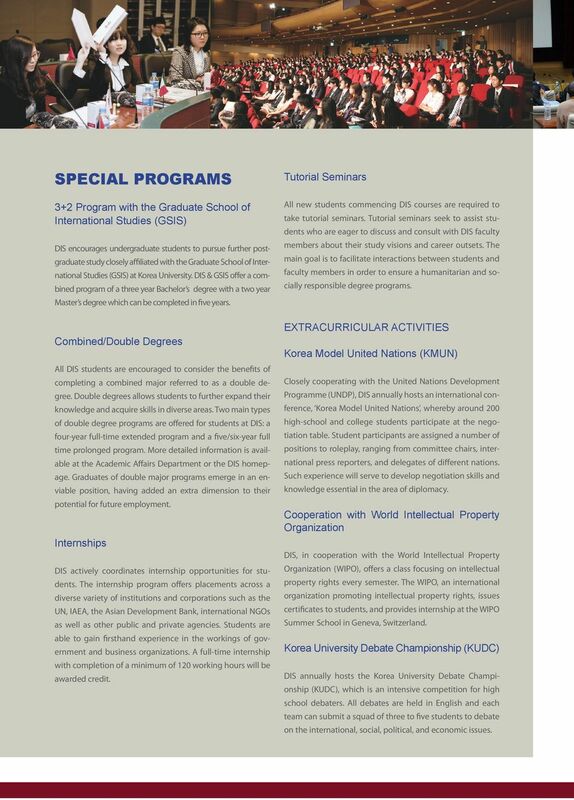 6 SPECIAL PROGRAMS 3+2 Program with the Graduate School of International Studies (GSIS) DIS encourages undergraduate students to pursue further postgraduate study closely affiliated with the Graduate School of International Studies (GSIS) at Korea University. DIS & GSIS offer a combined program of a three year Bachelor s degree with a two year Master s degree which can be completed in five years. Combined/Double Degrees All DIS students are encouraged to consider the benefits of completing a combined major referred to as a double degree. Double degrees allows students to further expand their knowledge and acquire skills in diverse areas. 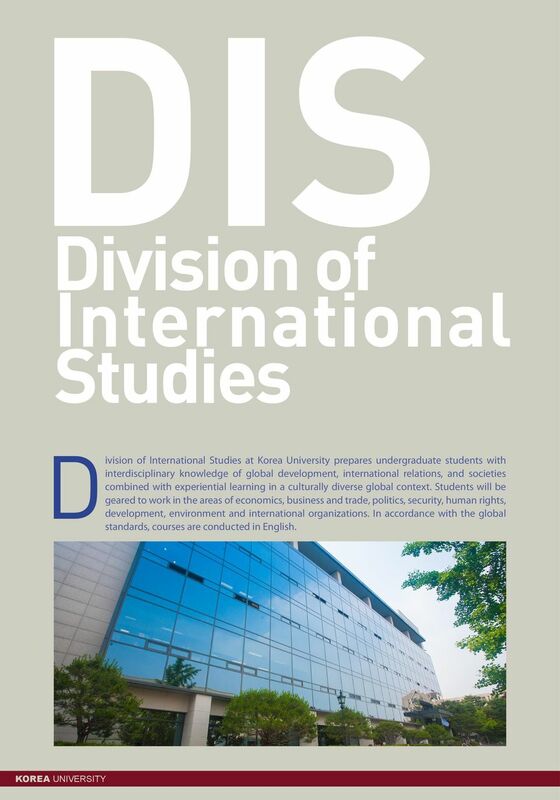 Two main types of double degree programs are offered for students at DIS: a four-year full-time extended program and a five/six-year full time prolonged program. 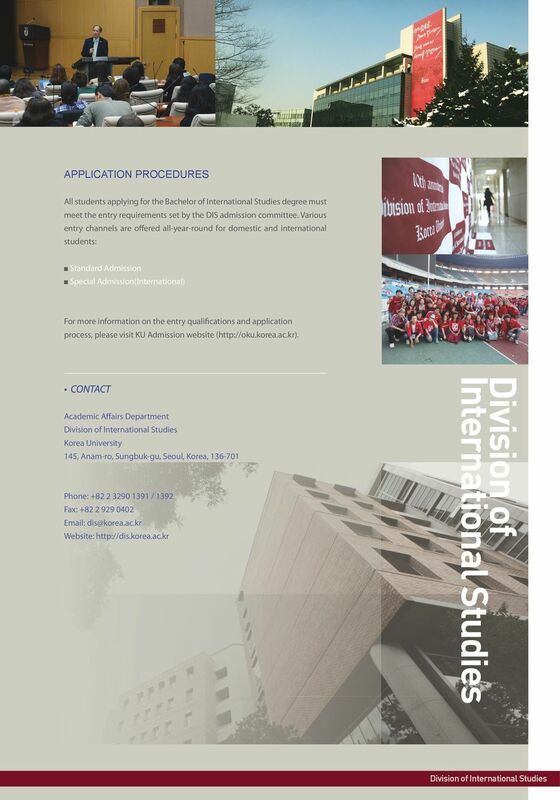 More detailed information is available at the Academic Affairs Department or the DIS homepage. Graduates of double major programs emerge in an enviable position, having added an extra dimension to their potential for future employment. Internships DIS actively coordinates internship opportunities for students. The internship program offers placements across a diverse variety of institutions and corporations such as the UN, IAEA, the Asian Development Bank, international NGOs as well as other public and private agencies. Students are able to gain firsthand experience in the workings of government and business organizations. A full-time internship with completion of a minimum of 120 working hours will be awarded credit. Tutorial Seminars All new students commencing DIS courses are required to take tutorial seminars. Tutorial seminars seek to assist students who are eager to discuss and consult with DIS faculty members about their study visions and career outsets. The main goal is to facilitate interactions between students and faculty members in order to ensure a humanitarian and socially responsible degree programs. EXTRACURRICULAR ACTIVITIES Korea Model United Nations (KMUN) Closely cooperating with the United Nations Development Programme (UNDP), DIS annually hosts an international conference, Korea Model United Nations, whereby around 200 high-school and college students participate at the negotiation table. Student participants are assigned a number of positions to roleplay, ranging from committee chairs, international press reporters, and delegates of different nations. Such experience will serve to develop negotiation skills and knowledge essential in the area of diplomacy. Cooperation with World Intellectual Property Organization DIS, in cooperation with the World Intellectual Property Organization (WIPO), offers a class focusing on intellectual property rights every semester. The WIPO, an international organization promoting intellectual property rights, issues certificates to students, and provides internship at the WIPO Summer School in Geneva, Switzerland. Korea University Debate Championship (KUDC) DIS annually hosts the Korea University Debate Championship (KUDC), which is an intensive competition for high school debaters. All debates are held in English and each team can submit a squad of three to five students to debate on the international, social, political, and economic issues. 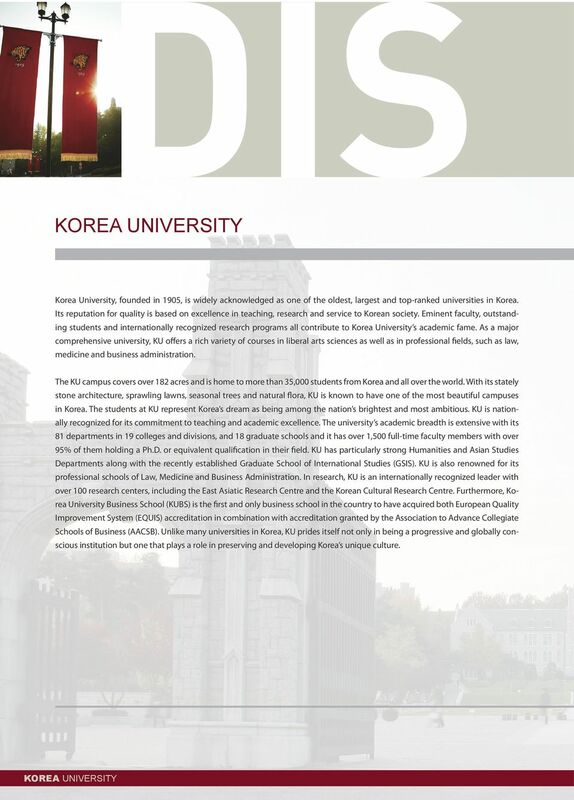 Information About Sogang University Introduction of Sogang University Sogang University is located in downtown Seoul, a metropolis of 11 million people. It was established in 1960 by American Jesuits. Institute of Philosophy Study Programmes Discover KU Leuven Situated in the heart of Western Europe, KU Leuven has been a centre of learning for nearly six centuries. Today, it is Belgium s largest university. EXECUTIVE MASTER OF ARTS AND SOCIAL SCIENCES FACULTY OF ARTS AND SOCIAL SCIENCES EXECUTIVE MASTER OF ARTS AND SOCIAL SCIENCES Do you want to make a difference and inspire those around you to do likewise? Department of Politics and International Relations M.A./Postgraduate Diploma in American Foreign Policy equivalent in Politics, History, International Relations, American Studies or other related subjects. The Haskayne MBA. Calgary s MBA. Psychology. Further information Admissions and Course Enquiries T: +44 (0)1752 585858 E: admissions@plymouth.ac.uk. 210 www.plymouth.ac. WHAT IS THE ITRU GROUP?